In 2016, the Chicago City Council passed ordinances requiring the issuance of permits to billboard operator Image Media Advertising for signs along the Kennedy Expressway. City officials subsequently refused to honor the ordinances, and the City Council later passed an ordinance purporting to repeal the earlier ordinances approving the permits. Gair Eberhard filed a complaint in federal court in Chicago alleging that the City’s actions amounted to a taking of private property under the Fifth Amendment and a violation of due process and deprived its client of vested property rights under Illinois law. The complaint sought damages, injunctive and mandamus relief. After a year and a half of contentious litigation, the City settled and issued the two permits to Image Media. On February 5, 2019, global real estate investment company Kennedy Wilson Properties Ltd. won summary judgment on a series of breach of contract claims brought by Chicago real estate developer Berger Realty. Berger had sought damages in excess of $3.5 million for a series of supposed breaches of a property management agreement and an alleged breach of fiduciary duty. Several claims were eliminated on a motion to dismiss and all but one minor issue were decided by the court in favor of Kennedy Wilson just weeks before a scheduled jury trial. In 2017, Savis, Inc., an engineering consulting firm in the pharmaceutical industry filed a 12-count complaint against 18 defendants, alleging a variety of tortious conduct, statutory violations and civil conspiracy. 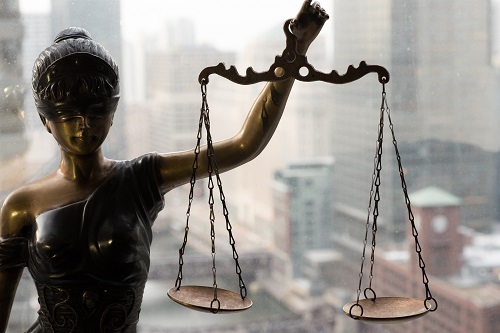 Savis claimed its former employees started a competing enterprise in violation of their duties and that one of its former clients (a pharmaceutical company) and the client’s executives conspired with Savis’ former employees to commit the tortious acts. Gair Eberhard defended the pharmaceutical company executives and won dismissal of the original and amended complaints. Gair Eberhard Nelson Dedinas Ltd. represented a senior-level in-house counsel in his whistleblower and retaliation claims against his former employer, a large healthcare network. During pre-merger due diligence, our client uncovered compelling evidence of billing practices and physician compensation arrangements that violated federal health care laws, including the Stark Law, Anti-Kickback Statute, False Claims Act and HIPAA. After raising concerns about the matters and urging the company to take remedial measures, the healthcare network terminated our client’s employment. Chris Gair and Kristi Nelson represented the client. We obtained a $1.6 million pre-suit settlement of his whistleblower and retaliation claims. Gair Eberhard Nelson Dedinas has been recognized as a leading law firm in Illinois by the new Chambers USA 2018 guide. The firm is recognized by the international publication for its General Commercial Litigation and White-Collar Crime and Government Investigation practices. Additionally, Chris Gair and Jeff Eberhard were individually recognized in the guide: Gair for his commercial litigation and white-collar and government investigation work, and Eberhard for his commercial litigation work. Chambers and Partners, the global leader in law firm research, employs more than 170 full-time editors and researchers, and conducts year-round interviews of law firms and their clients to produce its rankings. Chambers’ rankings are trusted by more in-house counsel than any other law-firm researcher. The Daily Southtown is reporting that a federal jury returned a verdict of at least $2 million in favor of Gair Eberhard Nelson Dedinas' client, a south suburban doctor, who was cheated by a former business partner out of hundreds of thousands of dollars over a period of years. After an eight day trial, the jury found in favor of our client on every count, finding that he had been defrauded, and that the managing partner of the medical practice had breached his fiduciary duties, as well as breaching our client's employment contract with the business. Key to the case was Chris Gair exposing that the medical practice's managing partner, Martin Hall, lied repeatedly on the witness stand, just as he had to his business partners, to siphon their profits into his own pocket. Certain legal claims remain outstanding, and will be decided by the court in the coming months, and could add hundreds of thousands of dollars in additional damages. Counsel for certain defaulters on real estate loans sued Lehman Brothers Holdings, Inc. and Lehman Brothers Bank, FSB for racketeering, fraud and other causes of action. Gair Eberhard Nelson Dedinas Ltd. responded with motions for both summary judgment and dismissal. Faced with these motions, counsel for the plaintiffs dismissed their claims with prejudice less than two months after filing them. Delaware Motel Associates v. Lehman Brothers Bank, FSB et al., 17cv1715 (Kennelly, J.) Counsel for Plaintiffs also agreed to dismiss with prejudice parallel claims in state court proceedings in DuPage County. On March 15, 2017, Gair Eberhard Nelson Dedinas Ltd. won an agreed judgment on consent in a case involving a forged non-competition agreement in the United States District Court for the Southern District of Indiana. The firm’s client is an event promoter who had a long-term equipment lease with the defendant and his company. After relations soured between the parties, they negotiated a rescission and mutual release agreement which called for a payment of $20,000 to the lessor. The promoter emailed the lessor an executed settlement agreement, and the lessor agreed verbally and by email to the terms. However, after delivering a $20,000 cashier’s check to the lessor and receiving what purported to be a fully-executed copy of the settlement agreement, the promoter learned that the lessor had created a different settlement agreement which included a five-year, worldwide non-competition agreement, secretly inserted it in the agreement, and copied and pasted the promoter’s signature from the true agreement. That spurious agreement would have prevented the promoter from obtaining financing, contracts with venues, and advertising contracts and would have led to the imminent destruction of the business. The firm filed an action for fraud and declaratory judgment in federal court in Indianapolis along with a motion for a TRO and preliminary injunction. Confronted with these filings and the proof of fraud, the lessor agreed to a consent judgment declaring that the initial agreement constituted the contract between the parties and that the non-competition agreement was not part of the agreement and was unenforceable. Partner Kristi Nelson has been named to the Chicago Volunteer Legal Services Advisory Board, whose members serve as ambassadors of CVLS in the legal community by working with the Board of Directors and CVLS management to build, maintain, and strengthen relationships with law firms, legal entities, the judiciary and other related groups and organizations in the legal community. Kristi has been involved with CVLS for many years, including serving the maximum term as a member of its Board of Directors. As part of her involvement, she has represented clients pro bono in immigration, employment, unfair housing, criminal, and civil rights matters. 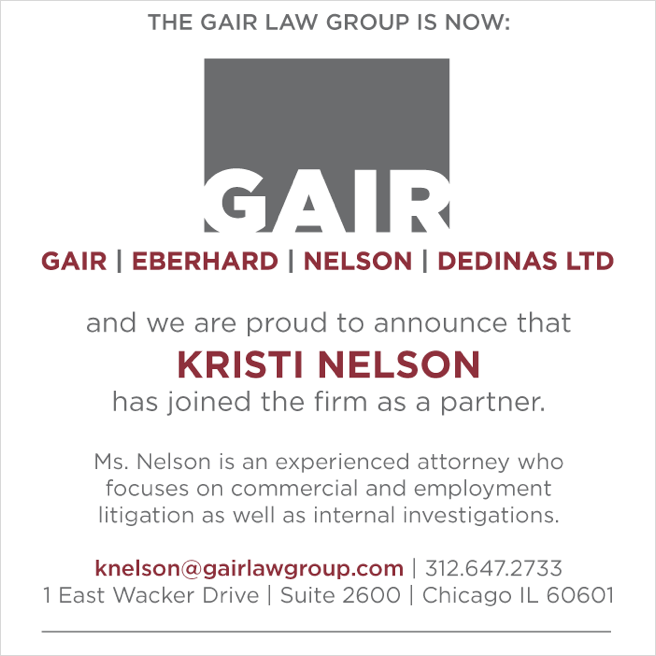 We are proud to announce today that Kristi Nelson has joined us as a partner, and we have renamed the firm Gair Eberhard Nelson Dedinas Ltd. Our location and all our contact information remain the same. On February 4, 2016, the Northern District of Illinois ruled in favor of Gair Law Group’s client, a publicly-traded REIT in the hotel industry, on important issues involving its guaranty of a non-recourse loan that was part of a commercial mortgage-backed securities (CMBS) trust. The case was brought by the lender Wells Fargo, through its special servicer Torchlight Loan Services, against the REIT, which had served as guarantor for a non-recourse loan made to its subsidiary LLC. After Torchlight foreclosed on the hotel in Indiana state court, it then filed suit in federal court and moved for summary judgment against the guarantor REIT, contending that certain non-recourse “bad boy” carve-out provisions in the loan agreements had transformed the loan into a full recourse liability, rendering the guarantor liable to Torchlight for the entire deficiency judgment. On January 8, 2016, the Seventh Circuit Court of Appeals reversed the district court's entry of judgment in favor of the Bank of New York and against GLG client Frederick J. Grede, the trustee of Sentinel Management Group, Inc. The case, originally tried by GLG partners Chris Gair and Jeff Eberhard while at Jenner & Block, was part of a larger constellation of litigation they led stemming from the collapse of Sentinel, a cash manager and investment advisor, in August 2007. With the victory against the Bank, the trustee's litigation team has recovered over $260 million for Sentinel's customers. On December 22, 2015, the Honorable Gene A. Zmuda of the Court of Common Pleas in Toledo, OH dismissed an action brought by a telecommunications company against GLG's client, a publicly traded hotel REIT. The plaintiff sued the REIT for breach of contract and unjust enrichment and sought damages of approximately $2 million. GLG moved to dismiss, crafting an argument that allowed the Court to interpret the contract as a matter of law and dismiss the action in its entirety at the pleadings stage. The Court adopted GLG’s arguments and dismissed the case with prejudice, representing a complete victory for the client. The client lauded GLG for its “aggressive” and “creative” strategy. Today, District Judge Thomas Durkin dismissed claims of Medicare fraud and False Claims Act violations against Gair Law Group client Healthsource of Naperville and its owner. On June 9, 2015, after a week-long jury trial in the Circuit Court of Cook County, GLG clients Henning-Carey Proprietary Trading and its principals Charlie Carey and Joe Niciforo obtained a verdict in their favor on claims brought by a former trader associated with the firm. The verdict represented a complete victory for Henning-Carey and ended five years of contentious litigation in which the plaintiff sought millions of dollars in damages. The jury soundly rejected the plaintiff’s claims and exonerated Henning-Carey of any wrongdoing. U. S. District Judge John W. Darrah today dismissed a case brought against two Nigerian companies and their president, all of whom were represented by GLG. In the wake of our most profound financial crisis since the Great Depression, citizens, elected officials and commentators of various political stripes have condemned what they see as a tepid response to the crisis by law enforcers. The Securities and Exchange Commission and the Department of Justice, which have primary jurisdiction to enforce the securities laws, have (perhaps justly) been criticized for not sufficiently pursuing charges and punishment against banks, brokerage firms and their individual employees for fast-shuffle, self-interested conduct that contributed to the loss of tens or hundreds of billions of dollars by investors.